Since 2008, the WDBC has provided a Handbook for owners of municipal and private systems that answers their questions on to how to achieve a successful design-build project. 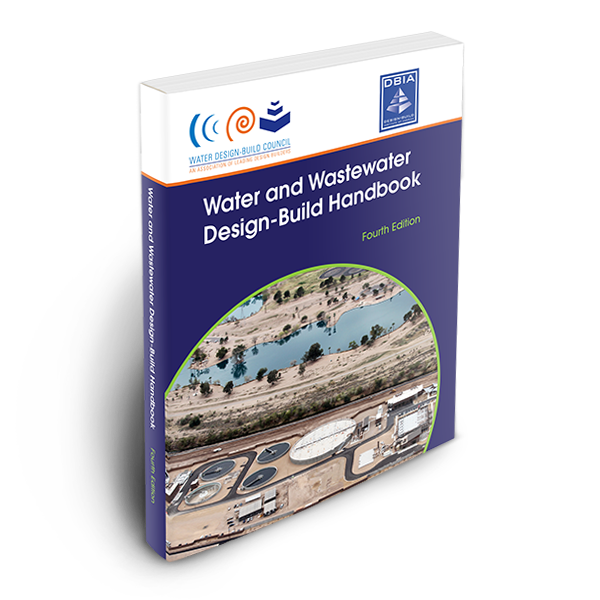 This 4th Edition of the Water and Wastewater Design-Build Handbook, also co-branded by the Design-Build Institute of America, is more encompassing and descriptive than previous editions. It has been updated and expanded to include clear direction to those responsible for procuring, designing, and building public and private water or wastewater capital projects in applying best practices for the various collaborative delivery methods. DBIA’s Best Practices are used to reinforce the overall principles and guidance provided within the chapter topics. To obtain a PDF copy of the 4th Edition of the Water and Wastewater Design-Build Handbook, please complete the form to the right. Utility Owners, WDBC Member firm employees, WDBC Advisor firm employees, and DBIA members currently in our database will receive a link via email to download the Handbook at no cost. Owners and Members not currently in our database will receive an email asking you to contact WDBC to receive your PDF copy. IF YOU DO NOT RECEIVE THE LINK, please check your “spam” folder or contact the WDBC office. All others, please check the appropriate box and further instructions will be sent to your inbox. Print copies (singles or box of 24) of the Handbook can also be purchased via PayPal with a Visa or Mastercard. Mail orders can be processed by downloading this order form. Additional questions, please contact the WDBC office at 410-798-0842 or info@waterdesignbuild.org.